Kemet had a “scientific and organic system” of observing reality. Modern-day science is based on observing everything as dead (inanimate). Modern physical formulas in our science studies almost always exclude the vital phenomena throughout statistical analyses. In Kemet, we knew the whole universe was animated. Animism is the concept that all things in the universe are animated (energized) by life forces. This concurs, scientifically, with the kinetic theory, where each minute particle of any matter is in constant motion, i.e., energized with life forces. In Kemet, numbers did not simply designate quantities but instead were considered to be concrete definitions of energetic formative principles of nature. The NTRW were named after the energetic principles = Nature. 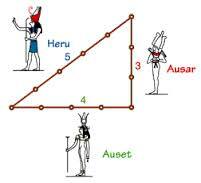 The upright, therefore, may be likened to the male, the base to the female, and the hypotenuse to the child of both, and so Ausar may be regarded as the origin, Auset as the recipient, and Heru as perfected result. Three is the first perfect odd number: four is a square whose side is the even number two; but five is in some ways like to its father, and in some ways like to its mother, being made up of three and two. And panta [all] is a derivative of pente [five], and they speak of counting as “numbering by fives”. Five makes a square of itself. The vitality and the interactions between these numbers shows how they are male and female, active and passive, vertical and horizontal, …etc. I go three times into the hekat (a bushel, unit of volume), a seventh of me is added to me and I return fully satisfied. Numbers were animated and personified. Likewise, calculations were personal in Ancient Kemet. We are part of the natural process in the universe. Even in our present-day, we hear the genius among us describe how they feel the subject of their excellence. They live their work in order to excel and exhilarate. Rules for enquiring into nature and for knowing all that exists, every mystery, every secret. The intent is very clear that Kemet set rules for numbers and their interactions (so-called mathematics) as the basis for “all that exists”. The famous Ancient Kemet hymn of Papyrus J 350 at Leiden confirms that number symbolism had been practiced in Kemet, at least since the Old Kingdom (2575–2150 BCE). It is a rare direct piece of evidence of the Kemet knowledge of the subject. The Papyrus consists of an extended composition, describing the principle aspects of the ancient creation narratives. The system of numeration, in the Papyrus, identifies the principle/aspect of creation and matches each one with its symbolic number. This Kemetic papyrus consists of 27 stanzas, numbered from 1 to 9, then from 10 to 90 in tens, then from 100 to 900 in hundreds. Only 21 have been preserved. The first word of each is a sort of pun on the number concerned.The numbering system of this Papyrus by itself is significant. The numbers 1 to 9, and then the powers 10, 20, 30, etc., now come to constitute the energetic foundations of physical forms. All the design elements in Kemet buildings (dimensions, proportions, numbers, …etc.) were based on the Kemetic number symbolism. The African name for the largest temple in Kemet, namely the Karnak Temple Complex, is Apet-sut, which means Enumerator of the Places. The temple’s name speaks for itself. This temple started in the Middle Kingdom in ca. 1971 BCE, and was added to continuously for the next 1,500 years. The design and enumeration in this temple are consistent with the number symbolism of the physical creation of the universe. The Egyptian concept of number symbolism was subsequently popularized in the West by and through Pythagoras who studied for about 20 years in Lower Egypt. Pythagoras and his followers left nothing of their own writing. Yet, Western academia attributed to him – and the so-called Pythagoreans – an open-ended list of major achievements. They were issued a blank check by Western academia. I love this article! I believe the woman is the originator. That is why she is vertical. Vertical is before horizontal.